I thought you'd be interested in this news about the former Panther supporter. This article was sent to you by someone who found it on SFGate. OAKLAND -- Former U.S. Rep. Ron Dellums ended months of speculation today and announced he will run for election as Oakland mayor next year in a move that shakes up the race to succeed Jerry Brown. Dellums' announcement came after months of urging by community activists, including a drive by independent volunteers who collected about 8,000 signatures begging the former congressman to run for office in his hometown. He credited that network with helping him make his decision. Dellums, a 69-year-old former Marine, served 28 years in the House of Representatives before retiring in 1998. "This is great day for Oakland," said Aimee Allison, 35, a petition organizer who said she had idolized Dellums since she was Stanford University's student body president in 1990. "This city will finally get the progressive leadership it deserves." The group, called the Draft Dellums for Mayor Committee, has been collecting signatures since July at street fairs, parks and other outdoor events. They shipped a huge box of signed petitions to Dellums via UPS on Thursday in a last-ditch effort to convince him to run. Other candidates for mayor are City Council President Ignacio De La Fuente, who has raised the most money and has outgoing Mayor Brown's endorsement; Councilwoman Nancy Nadel; school board member Dan Siegel; Alameda County Treasurer/Tax Collector Donald White; and Glynn Washington, director of the Council for Responsible Public Investment in Oakland. The movement to draft Dellums began in June when the former congressman attended the 50th anniversary celebration of the Oakland Citizens Committee for Urban Renewal and political activist Geoffrey Pete publicly urged him to run for mayor. The crowd spontaneously began chanting, "Run, Ron, run." "My speech was directed at one person -- Ron Dellums -- but everyone in the crowd heard my words and just started chanting spontaneously," Pete said last week. Just the rumor that Dellums might run was enough to stimulate several generations of progressive political activists in the Bay Area who have worked with him opposing the Vietnam War and South African apartheid and supporting de-militarization after the end of the Cold War. 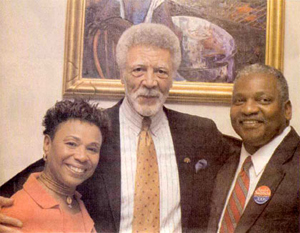 "Ron Dellums has been a leader for us on so many national and international issues, we are hoping he will continue that leadership locally," said Kitty Kelly Epstein, a professor of education at Holy Names University who helped organize the Draft Dellums for Mayor Committee from clergy, union members, business owners and other community activists. Epstein said members of the group hoped that Dellums as mayor would raise the level of political dialogue and debate in Oakland, and not focus on winning votes and making deals. "We've been telling him that Oakland needs him," Epstein said. "This is the one candidate who has the stature and the resources to defeat big money and govern the city on our behalf." Dellums maintains homes in Oakland and Washington, D.C., where since his retirement he has mainly worked as a lobbyist to the federal government. He has not been active in local politics and has spent most of his time on the East Coast. But starting last summer, Dellums began spending more time in the Bay Area at his family's home off Lakeshore Boulevard. He spoke at several events, ranging from the Mills College commencement in May to the San Francisco Foundation's 2005 Community Leadership Awards dinner on Sept. 20. De La Fuente, who lost the mayor's race in 1998, said he would remain a contender, even though he admitted he may have just gone from front-runner to underdog. "I think my good friend Ron Dellums has had a long and successful career in Washington as a representative and lobbyist," De La Fuente said. "We will just work harder. This race will be about who can do the best job running Oakland. I'm confident I'm the best man. But I'm not over-confident about winning." Nadel said she also planned to keep running even though she shares the same base of support as Dellums -- progressive and African American voters. "I'm staying in," said Nadel, noting she is the only woman in the race. "I respect Congressman Dellums. But I still think that we need a progressive mayor who lives in Oakland and is familiar with Oakland issues." Dellums was born Nov. 24, 1935, and raised in West Oakland in a politically active family. He is the nephew of C.L. Dellums, the vice president of the Brotherhood of Sleeping Car Porters, the most prominent union made up primarily of African Americans. Dellums gained notoriety as an unwavering opponent of the Vietnam War. In 1970, anti-war activists recruited Dellums to successfully run against incumbent U.S. Rep. Jeffery Cohelan, a liberal Democrat whose support for the war drew opponents in the district. In what may be the most liberal congressional district in the nation, he won 77 percent of the vote in 1996. Dellums hasn't faced a tough race since that time.